After more than a decade Disney and McDonald’s are back together just in time for the release of ‘Incredibles 2′. The new partnership will bring Disney-branded Happy Meals back to McDonald’s this summer. The two companies parted ways when childhood obesity rates were rising and there was widespread concern over calorie-laden children’s meals at fast food restaurants. Earlier this month McDonald’s announced that it was revamping its Happy Meal menu and would offer selections that were lower in calories, sodium, saturated fat and sugar. This meant ditching cheeseburgers and chocolate milk from the kids’ menu. These items will still be available for purchase, but McDonald’s will not list them on the menu. The thought being that these items will be less likely to be ordered. McDonald’s plans to promote “Wreck-It Ralph 2: Ralph Breaks the Internet” in November. Okay…..who besides us used their kids to get the toys….errr…..’collectibles’ for themselves? Okay…I’m not proud of it, but yeah we did. When my kids were younger the Disney-themed Happy Meals did their job. Depending on the toy being offered we often went weekly and sometimes checked with McDonald’s in the area to see if they had a particular toy to complete our sets. Unfortunately my kids have now grown up and are too old for Happy Meals…or are they? This Sunday Disney seemingly “shook” the Disney fan community with it’s annual ticket price increase for Walt Disney World and Disneyland Resort. The uproar and shock of Disney ticket prices seems to happen every year yet it happens every year and at this time of the year for the last five years or so. Value ticket will remain at $97. At Disneyland Resort in Anaheim, a Signature Plus annual pass is now priced at $1,149, a Deluxe is $729 and a SoCal Select costs $369. If you talk to people visiting Disneyland Resort over the last few years a common complaint is the fact the parks are very crowded, especially on weekends. For locals that don’t have Annual Passes I will acknowledge that the single day ticket increase might be an issue. For guests coming from out of the local area this isn’t really an issue. Most of these guests are going to be buying multi-day passes, staying 3-5 days, which even though saw price increases the price per day is still significantly less than the single-day pass. Disneyland for the most part depends on the Annual Passholder for its ticket revenue, but the problem over the last few years is the number of passholders that are coming during peak times, especially on weekends is causing crowding and parking issues. While not publicly stated, Disneyland has been using prices and blackouts to lower the number of passholders especially those visiting on weekends. Walt Disney World also raised the price of its annual passes at the different theme parks. At its Florida parks, a silver pass now costs $439, a gold pass costs $589 and a platinum pass is $849, or $729 for Florida residents. The platinum pass rose by $70, or $50 for Floridians. According to Forbes, Disney claims the reason behind the rising prices is to help regulate crowd sizes throughout the year in hopes of reducing the wait at the parks. Frankly, this is really the only way to limit the number of guests in the parks. People have complained that the price increases are pricing out the ‘average family.’ Yet, despite the price increases over the past few years, the parks have gotten more crowded. There used to be ‘slow times’, especially early December and the early part of the year before Spring Break and Easter. Those slow times are gone and basically the crowds have gone from “Insanely Crowded”, “Crowded” to “Less Crowded.” There is no slow time at Walt Disney World anymore. Despite the price increases people are still coming, even if it means they have to save longer for the trip. So if you look at the ticket prices to regulate crowds Disney obviously hasn’t hit the ceiling…yet. Will this be the price increase that does it? We’ll have wait and see. Whenever Disney ticket prices increase people come out of the woodwork and complain, some even stating they’ll never go to the parks again…..yet more people are going to the parks than ever. The one thing that needs to be mentioned. Very few people and families that visit Walt Disney World purchase the one-day ticket. Except for locals who don’t have Annual Passes or Florida Resident passes, very few people visit Walt Disney World for only one day. Those of us who need to budget for a trip to Walt Disney World and don’t have Annual Passes, Disney is aware of this. Until these plans are released what can the average guest do now that the prices have increased? My suggestion is to book your trip as soon as possible and contact third-party sellers of WDW tickets. Guests need to comparison shop the third parties to see which are cheapest. Third party that are trusted and recommended by multiple people are ParkSavers, Get Away Today, Official Ticket Center or Undercover Tourist. These third party re-sellers still have some tickets at the old pricing, but these tickets won’t last forever, so it is imperative that if you have a trip planned anytime in the near future and haven’t bought tickets and want to save money, that you contact these companies as soon as possible. No one likes to see price increases….for anything, but this is not the end of the world. Yesterday at D23 Expo Japan, Bob Chapek, Chairman of Walt Disney Parks & Resorts, announced a series of exciting new updates for Disney Parks around the world. One of the most anticipated items that was announce at D23 Expo last July is the Star Wars-inspired resort planned for the Walt Disney World Resort. 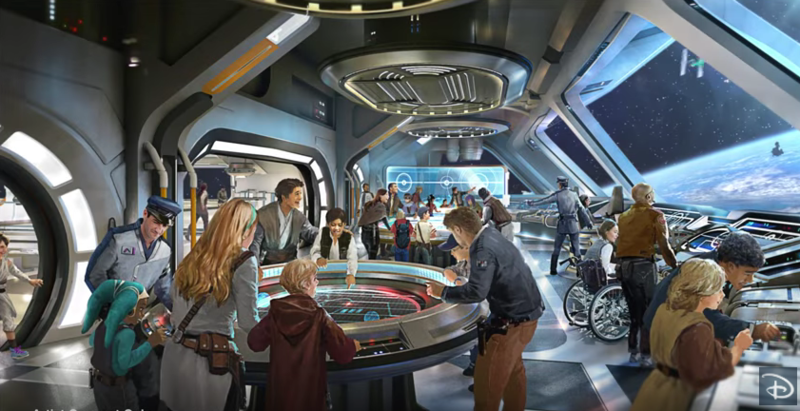 According to Chapek, “It is going to be unlike anything that exists today.” At the D23 Expo Japan Disney shared a new look of the first-of-its-kind resort that will combine a luxury resort with a complete immersion into an the Star Wars story. Many of us Star Wars Disney fans were looking forward to the immersion at this resort will that will stand out among all of the Disney resorts around the globe. The huge announcement was that it will be seamlessly connected to Star Wars: Galaxy’s Edge at Disney’s Hollywood Studios. This will give guests a total Star Wars experience. I don’t know if I’ll ever stay at this resort, but I am excited about the concept and the possibilites that could be incorporated into it. Chapek also unveiled a first look at Epcot’s highly-anticipated “Guardians of the Galaxy”attraction. The big takeaway…. it’s a roller coaster! If the Imagineers at WDI do anything close to what they came up with for Guardians of the Galaxy – Mission: BREAKOUT! this attraction could be truly amazing. I for one cannot wait until it opens. Now to the Disneyland Resort. 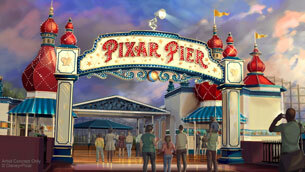 Chapek announced that Pixar Pier will open June 23 at Disney California Adventure park. Pixar Pier will be featuring four whimsical neighborhoods representing beloved Pixar stories with newly themed attractions, foods and merchandise. 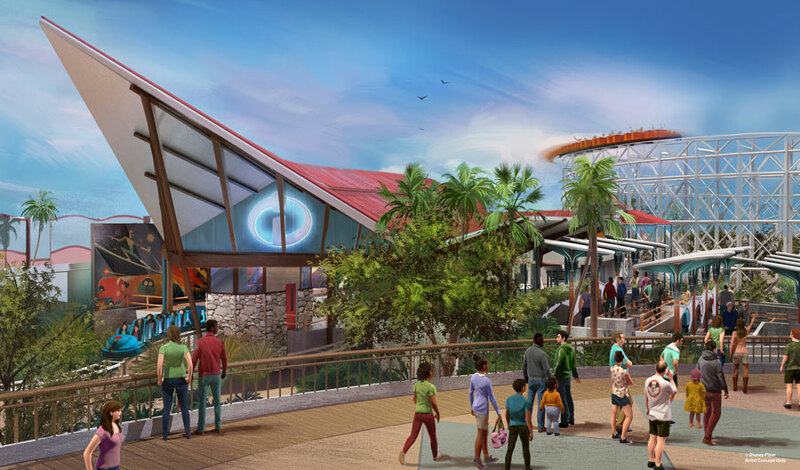 As announced earlier, Pixar Pier will also include the Incredicoaster. This coaster will be a super combination of character figures, lighting and special effects that that is being promoted, will bring the Parr family racing alongside you in a high-speed adventure. I am a huge Incredibles fan. I think that it’s one of my favorite Pixar movies. Of all of the things coming to Pixar Pier, this attraction is the one that I am looking forward to the most. 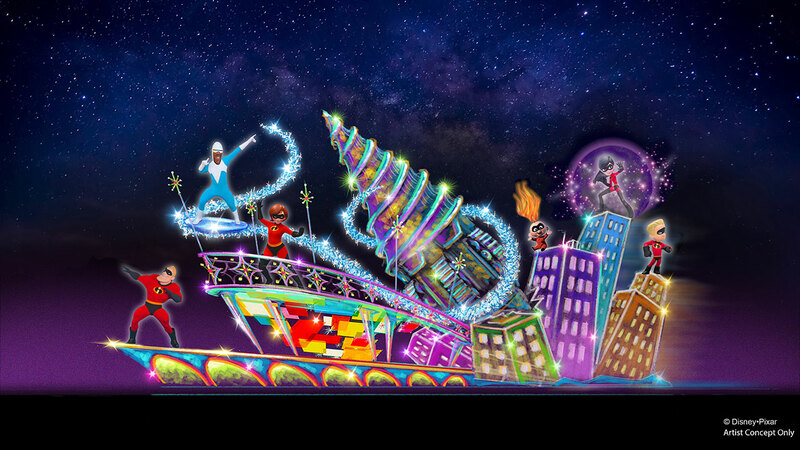 In addition to the Incredicoaster the announcement, Disney also announced that in June a dazzling new float for the popular “Paint the Night” parade featuring Mr. Incredible, Elastigirl and Frozone from “The Incredibles” will be coming to Disney California Adventure. I absolutely love the “Paint the Night” parade. In my opinion it’s the best nighttime parade Disney has ever produced for the domestic parks. Adding an Incredibles float makes it even better. 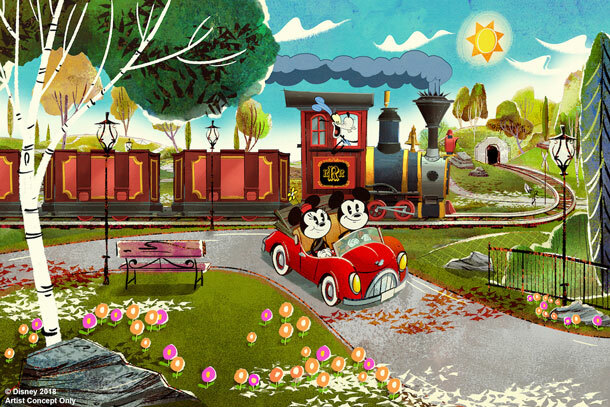 Chapek also announced that Disney’s first Mickey-themed ride-through attraction, “Mickey & Minnie’s Runaway Railway” at Disney’s Hollywood Studios will be opening next year. While I will really miss “The Great Movie Ride,” I am really looking forward to this attraction. I’m hoping that it’s done really well making it a fun attraction for the Studios. The “2 1/2 – D” sound like it might be a lot of fun. In Disney’s description it is supposed to be like 3-D except without the glasses. What can I say….except….sign me up! 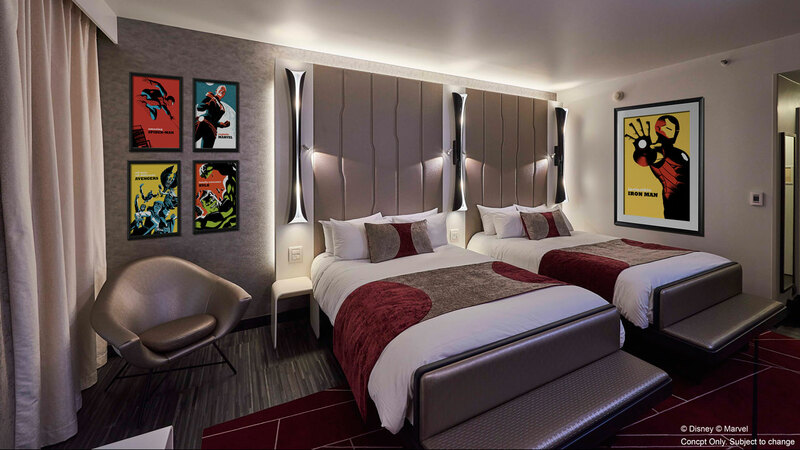 As for Disneyland Paris, Disney is re-imagining one of its resort hotels into Disney’s Hotel New York – The Art of Marvel. Chapek shared a sneak peek into one of the rooms that will open the re-imagined hotel in 2020. Chapek also announced that the Marvel Super Hero universe will be coming to Walt Disney Studios Park. The Rock ‘n’ Roller Coaster Starring Aerosmith will be totally reimagined as a high-speed, hyper-kinetic adventure where guests riding the coaster will team up with Iron Man and their favorite Avengers. I don’t know when I’ll ever get to Disneyland Paris, but if I ever do get there, this attraction will be on the top of my list to see and do there. I like what Disney announced at D23 Expo Japan 2018. What do you think? Last week Walt Disney World announced that guests will see new attractions and entertainment experiences as “beloved stories from several Disney films come to life” at Walt Disney World this summer. Guests can party with Mr. Incredible, Elastigirl, and Frozone from Disney•Pixar’s “The Incredibles” and the soon-to-be blockbuster “Incredibles 2.” Edna Mode, the greatest superhero costume designer, will also make her debut appearance. Each evening, guests can enjoy a “SUPER” dance party on the Rocket Tower Stage. Don’t we already have a dance party and an Incredibles one at that in Tomorrowland already? Okay Edna Mode is new and it will be themed to Incredibles 2….but this really isn’t anything new. Star-Lord and Gamora from “Guardians of the Galaxy” will join an alien band, taking guests on a journey through the cosmos. The party will feature hits from Awesome Mixtapes 1 and 2 – fun and favorite tunes from the two movies’ soundtracks – building the anticipation for a new Epcot Guardians of the Galaxy attraction. This sounds like it could be fun….though it sounds a lot like the ‘Guardians of the Galaxy Awesome Dance Off!’ that’s being held in front of Guardians of the Galaxy – Mission: BREAKOUT! at Disney California Adventure, minus the “dance off” part. Fun….new to Epcot, promotes the upcoming attraction, but not original. Two new can’t-miss offerings will debut at Disney’s Animal Kingdom in time for the park’s 20th anniversary. First, guests can discover new bird species from around the world at the new show “Explorers Meet UP! A Great Bird Adventure,” which will star Senior Wilderness Explorer Russell and his furry friend Dug. The park will also launch a “dino-tastic” celebration, in which Donald Duck takes over Dinoland, U.S.A., in a new character celebration. “Explorers Meet UP! A Great Bird Adventure” sounds like an UP re-themed “Flights of Wonder” attraction to me. I’m a big fan of the movie UP but this doesn’t sound really new. I am curious to see what the “Dino-Tastic Celebration for Donald Duck” will be. While I was hoping for a new parade for Disney’s Animal Kingdom, this new celebration could be fun and is much needed for Dino-Land which lacks anything significant to keep people there beyond the few attractions that draw people there. For me this might appeal to locals or for a rainy day. I don’t know about you, but with the money I spend for a trip to vacation at Walt Disney World I’m not sure I want to spend two hours watching a movie that I can watch at home. One major highlight of “Incredible Summer” will be the grand opening of Toy Story Land at Disney’s Hollywood Studios. This new 11-acre land will shrink guests to the size of a toy and allow them to explore the fun and adventure of Andy’s backyard. 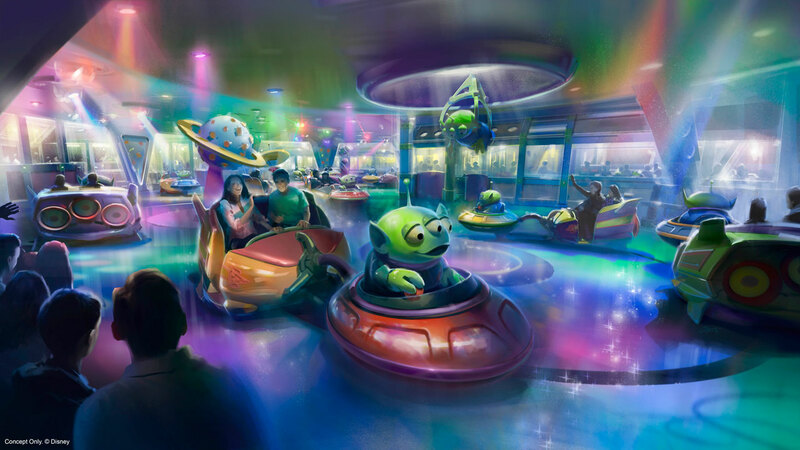 There, guests can experience two new attractions: the family coaster Slinky Dog Dash and Alien Swirling Saucers. Toy Story Land also will feature an existing guest-favorite attraction, Toy Story Mania!, which will expand to add a third track into the rotation. The land’s Woody’s Lunch Box will be a new quick-service restaurant that will offer up tasty meals and old-fashioned soda floats to Toy Story Land guests. This what I’m looking forward to. I cannot wait until this opens. I’m really hoping that Toy Story Land is open when I’m at Walt Disney World this summer. Except for Toy Story Land and the Dino-Tastic Celebration in Dinoland none of the rest excites me much, but considering that all of this is limited to the summer season when the parks are fairly busy and there is a huge need to entertain people when they aren’t able to get on attractions or into other shows these are probably good and fun enough to serve the purpose. What do you think of Incredible Summer?